A farmhouse with really ancient origins. Picturesque old country house placed in a peaceful position with stunning view over the below valley. The property is reachable by an unmade road 1,5 km long. Its origins are really back in the past as some 1500 clerical registers and documents certify. The city of Arezzo, events and services. Arezzo is 10 km far and with its folkloristic and cultural events (such as Giostra del Saracino and Fiera Antiquaria) is worth visiting. The redbrick ceilings with beams, the floors made of original terracotta and the simple furniture offer a rare example of Tuscan rural style and traditions. Outdoor areas, pergola and swimming pool. 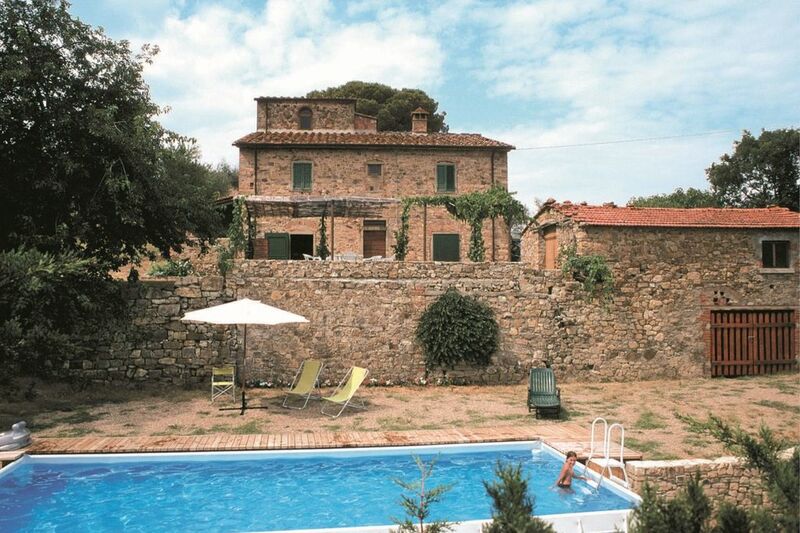 In the garden there are a 5x9 m swimming pool (depth 1,20 m) and an attractive pergola equipped to have meals. Those who loves horses will find riding stables about 500 metres far from the property. GROUND FLOOR: laundry room, bathroom with shower. FIRST FLOOR: Spacious dining room with kitchen facilities and a truly beautiful stone fireplace, double bedroom, two bedrooms with two single beds, bathroom with bath and shower. An attractive wooden staircase takes you up to a living room, which has been created under the roof, with a single sofa bed. EQUIPMENT: oven, washingmashine, fridge, microwave, Wi-Fi Internet access. Binnen was alles keurig netjes. De eigenaren zijn sympathiek, communiceren was een beetje moeizaam (spreken bijna geen engels). De weg naar het huis is even wennen, onverhard met kuilen en smal. Zwembad was heerlijk, werd om de dag schoongemaakt en het terras is erg mooi met druiven boven je hoofd. Wel een muggen/vliegenspray meenemen. Bbq aanwezig is erg handig. Is niet geschikt voor mensen die slecht ter been zijn i.v.m. trappen. In de omgeving is er een scoop om boodschappen te doen, maar er is er 1 nog dichterbij. In Arezzo heerlijk gegeten bij een lokaal restaurant, lekker en niet duur. Ook naar een woonboerderij in Arezzo geweest Fattoria il muro. Voor €15 op heerlijk geproefd en kleine hapjes. Neem wel cash mee, want je kunt daar niet pinnen. Vanuit Arezzo met de trein naar Florence geweest. Parkeren bij het station. Kaartjesautomaat op het station aanwezig. Ook naar Sienna geweest met de auto, vroeg vertrekken anders heb je geen parkeerplaats meer. Al met al een heerlijk huis met een superligging. Zeker een aanrader! Alleinstehendes Toskanaferienhaus mit schöner Aussicht, groß, geräumig und schön eingerichtet. Gepflegter privater Pool, gute Parkmöglichkeit sowie große Veranda. Sehr freundlicher, flexibler und zuvorkommender Besitzer, aber spricht nahezu kein Englisch oder Deutsch, Verständigung dennoch trotzdem gut möglich. Weiter zu empfehlen! [English translation courtesy of Easy Reserve] Detached Tuscany holiday home with beautiful views, large, spacious and nicely furnished. Well maintained private pool, good parking and large veranda. Very friendly, flexible and courteous owner, but speaks almost no English or German, communication nevertheless still possible. To recommend! Wunderschönes Haus mit einem großen Pool. Die Vermietern waren sehr nett. Das Haus ist auf alle Fälle empfehlenswert. [English translation courtesy of Easy Reserve] Beautiful house with a large pool. The landlords were very nice. The house is definitely recommended. C'est notre deuxieme sejour a la Casa Rossa et nous adorons toujours autant. Un cadre incroyable, perchée a flanc de coteaux au milieu des vignes et oliviers avec une vue imprenable. C'est magique. la maison, la terrasse, le jardin et la piscine sont très agréables. Nos 4 enfants étaient tres contents aussi. Nous avons testé aussi cette année le petit restaurant de Pieve, tres sympa. This was our second stay at Casa Rossa with our 4 children. It was really Great. The house and surroundings are beautiful and the host is very kind. This is our second stay at Casa Rossa and we still love it so much. An incredible setting, perched on a hillside among vineyards and olive groves with breathtaking views. It is magic. The house, the terrace, the garden and the pool are very nice. Our 4 children were very happy, too. We also tested this year the small restaurant of Pieve, very nice. Très bon accueil de la part du propriétaire, une maison conforme à la description du site. L'équipement est certes basique mais c'était précisé dans l'annonce. Le site est très beau avec vue sur la vallée et Arezzo. Idéal pour une famille avec des enfants (pas trop petits en raison des escaliers et de la piscine). On recommande!